I'm hoping to catch up on my August posts before the end of the month...I have 5 days to capture a month's worth of photos! Think I can do it? Don't hold you're breath. lol! But I'll do my best! There was a beautiful full moon on August 13th and Jimmy and I went out on an moonlight stroll. 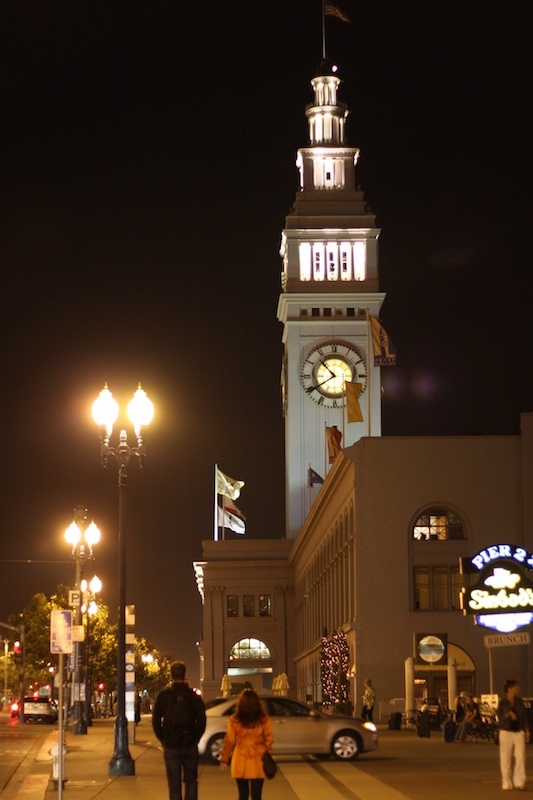 We walked out to the Embarcadero. 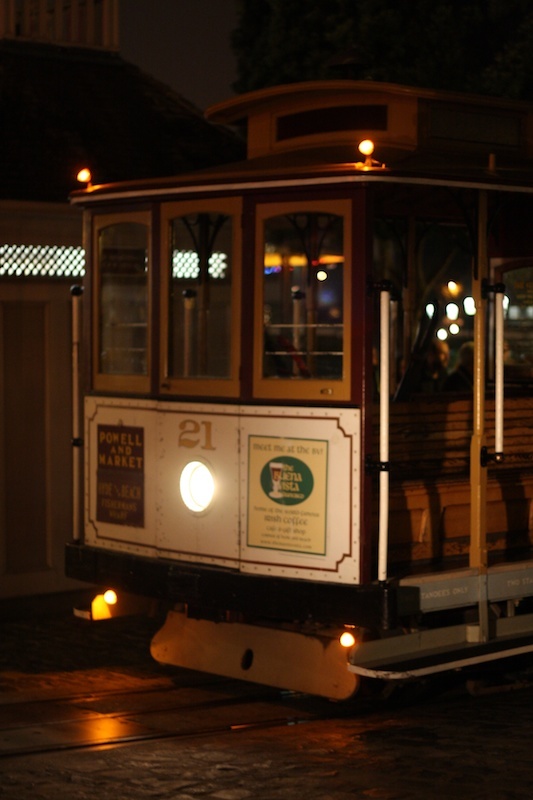 Took the Trolley to Pier 39 then walked to Ghirardelli Square for a midnight snack where one of Jimmy's buddies met us and gave us a ride back home. Here's a little photo tour of our night. 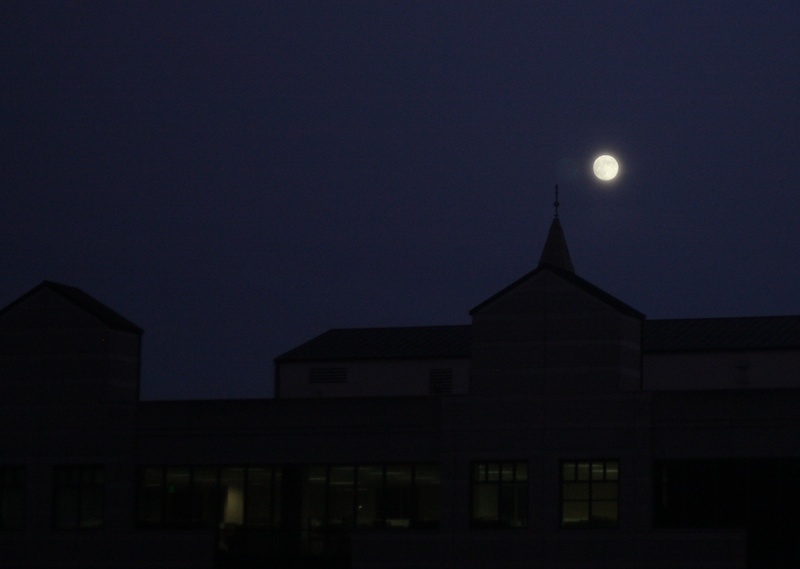 When we saw the moon crest over the office building next to our complex, we knew it was a great night for a walk. 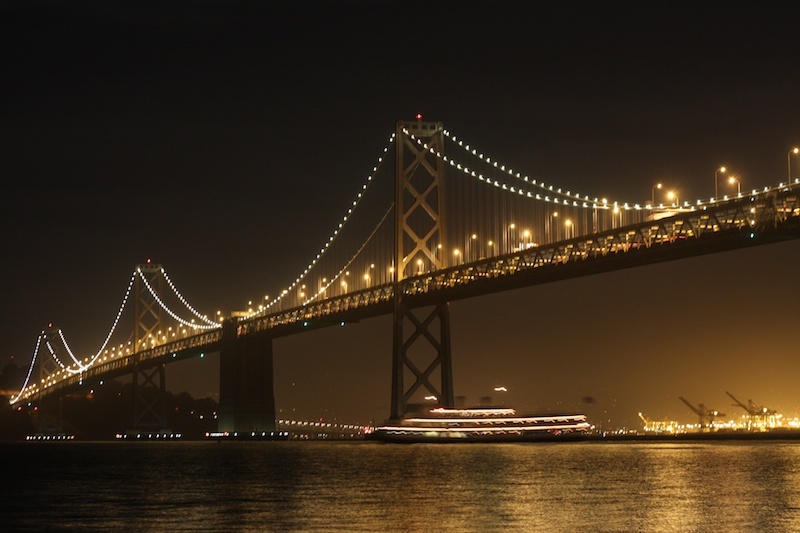 A funny little thing about San Francisco in the summertime - everyone was wearing coats, several were in goose down winter coats with fur lined hoodies. 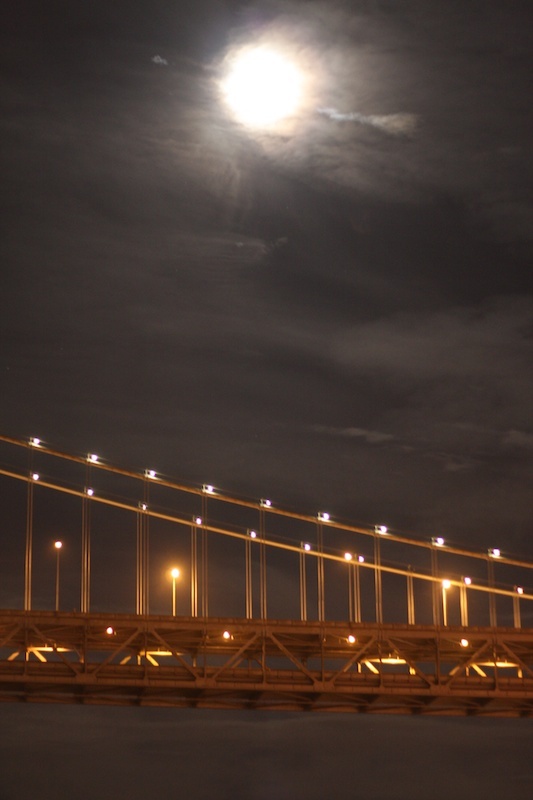 When we got to the Embarcadero, the moon was just above the Bay Bridge. We spied a Bay Cruise sailing under the bridge. 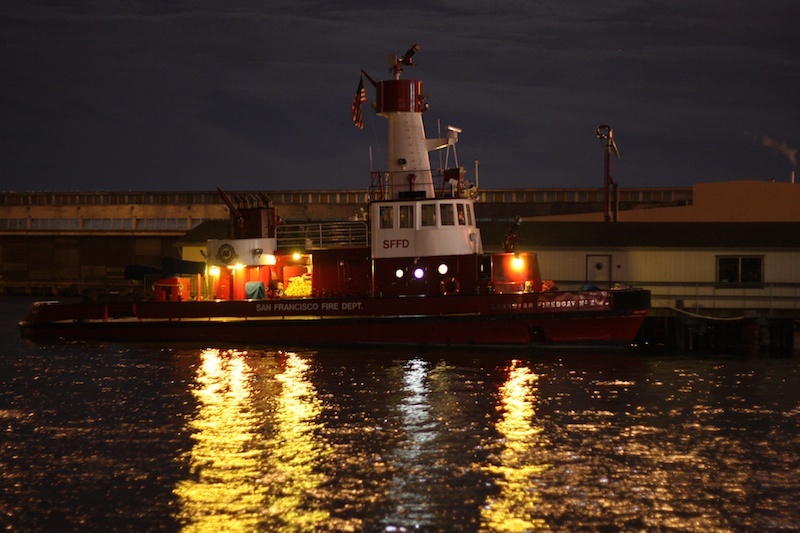 We thought it was pretty cool that the San Francisco Fire Department's fire boat was lit up all pretty. 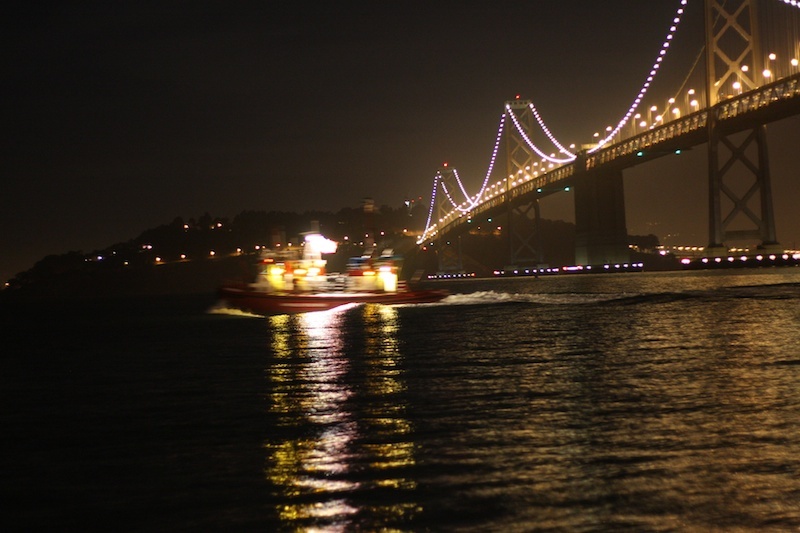 Then we realized it was getting ready for an emergency in the bay when fire trucks came speeding down the Embarcadero with the firemen. We realized then that the fire station by the water is unmanned and the firemen had to come from another station. They all ran out to the waiting boat and quickly sailed away towards their emergency. 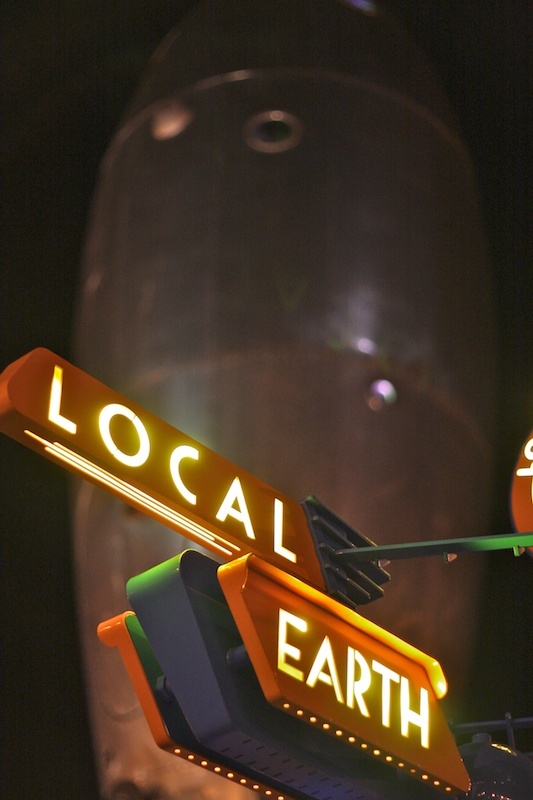 we stopped at the Raygun Gothic Local Earth Rocket Ship. 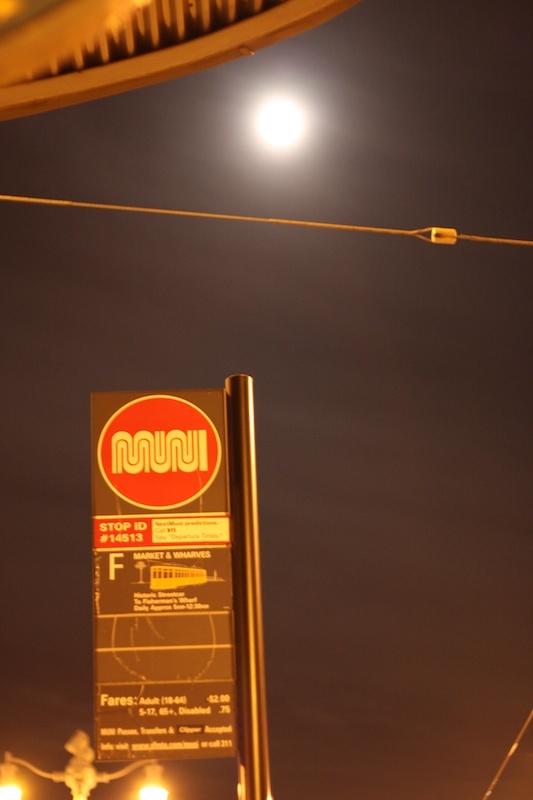 We took another moment to enjoy the full moon while we waited for the trolley to take us to Fisherman's Wharf. 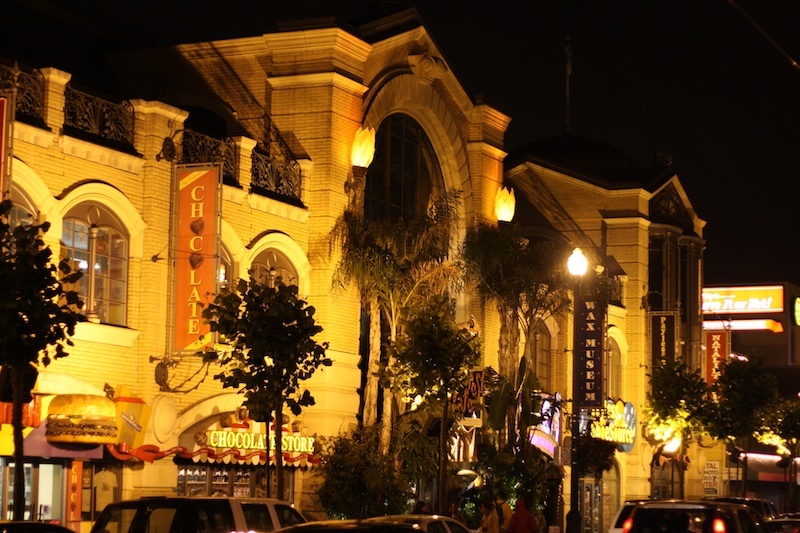 Is this Fisherman's Wharf or Disneyland? Hard to tell the difference sometimes. 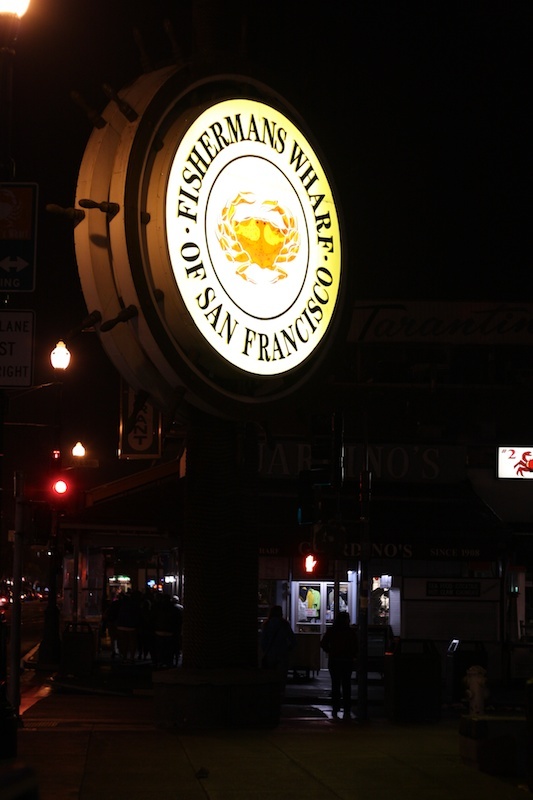 But we were definitely at Fishermans Wharf. We walked by the cable cars on Hyde Street. 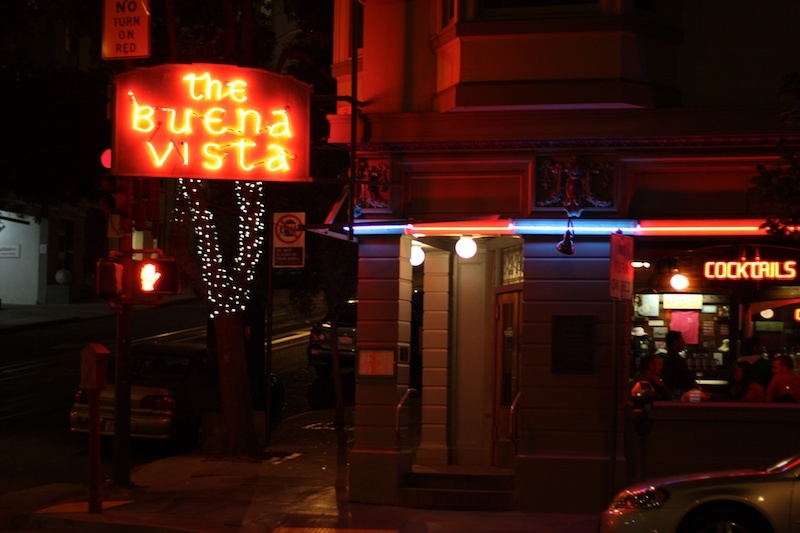 Should we have a nightcap at the Buena Vista? 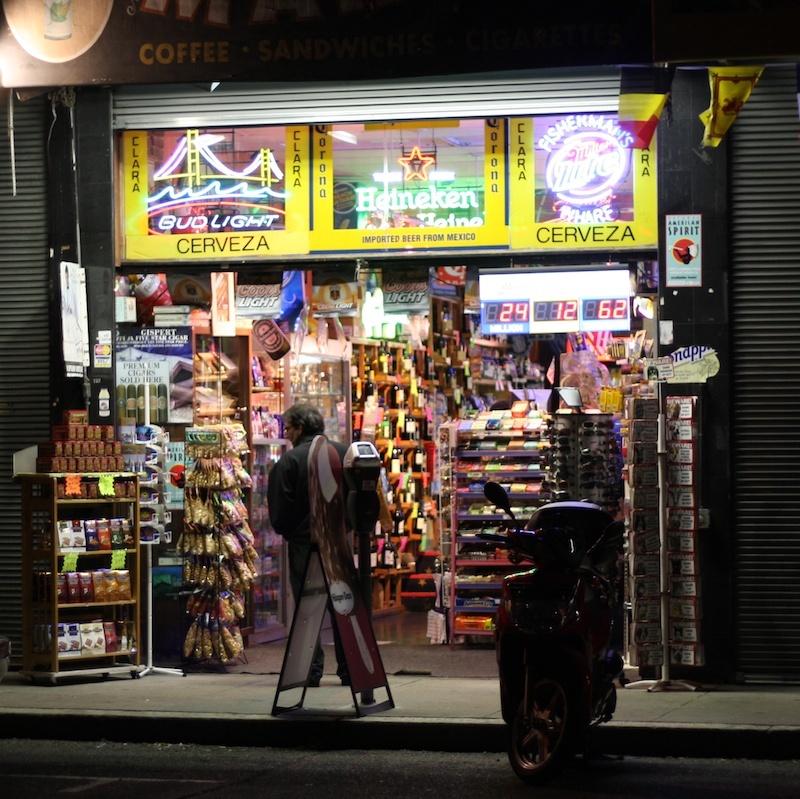 Or pick up some chips and candy instead? Nope! Ice cream from Ghirardelli is definitely what we prefer! Moonlight sonata! 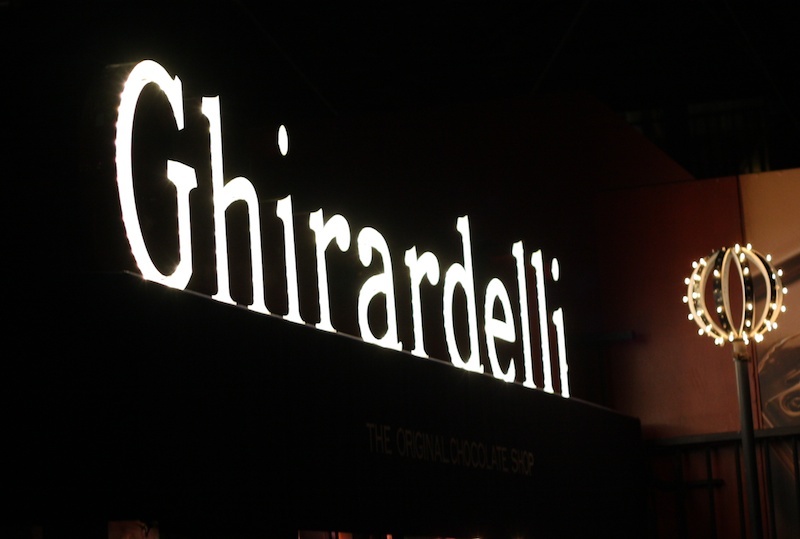 That's what a moonlit walk would be, ending up at Ghirardelli's! :) A perfect date out. You and Jimmy do these well.